Casino Holdem pitches your Texas Holdem skills against the house. This game first appeared in the early 2000s and saw a rise in popularity on the back of the 'poker boom'. Now you can find it spread in casinos across the world, from Las Vegas to Macau. The game is also a favourite of online casino players, and thanks to developments in technology, you can now enjoy Casino Holdem on Live Dealer tables too. Here you can find out the best strategy for playing Casino Holdem at the 888 Live Casino. 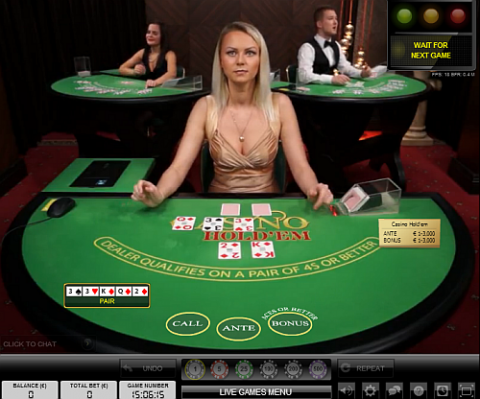 The games are provided by Evolution Gaming and are ran by very friendly and professional dealers in Latvia and Malta. While the casino's software is used to interact and place your bets, all the action is real and can be watched via HD quality live streams. These games create the best casino experience you can find, without actually travelling to one, and by following the simple strategy below, you can increase your chances of being able to celebrate a win. Non-US Players: My go-to studio is operated by Evolution Gaming, and is available via the leading big brand PlayTech powered casinos. If you are in the UK, then Titan Bet Casino is a very strong (and fully licensed) rec. Outside of the UK then I recommend the long-running Europa Casino instead. US Based Players: The Vegas Technology studio offers this game, and the very easy recommendation of the casino which hosts them is the long-running BetOnline.ag. Based in Panama, this brand is already the leading US offshore sportsbook – and is fast becoming the go-to casino as well. Playing Casino Holdem is very similar to a regular Texas Hold'em game. The key differences are your ability to bet is restricted, and you are only playing against the house, not the other players. If you wish to be dealt into a Casino Holdem hand, you must first place an ante. This can be anything within the table limits, although it is worth remembering this bet size controls your next wager, if you wish to play the hand to the end. Two cards are dealt to both yourself and the dealer, with the dealers hand faced down. The Flop is then dealt and you decide if you wish to continue or not, based on the strength of your hand. If you do not think your hand is strong enough you can fold and give up your ante bet. If you wish to continue however, you can call for twice your ante amount. The Turn and River cards are then dealt and the dealer reveals their hand. In order to be able to play, the dealer must qualify by having one pair or higher. This is based on their best five card hand, so if the board pairs then the dealers hand automatically qualifies, without needing any help from their hole cards. While Casino Holdem appears a simple games of 'fit or fold' on the flop it is actually more complicated than that. For a start if you keep folding when you miss you will give up far too many antes, plus you need to remember the dealer has to qualify in order to play their hand. You should also consider the chances of your hand improving on the Turn and River, as well as whether the payouts make your decision mathematically correct or not. This all creates many variables, although learning optimal strategy can bring the house edge down to around 2.5%. Instead here are some easy to remember rules, which while not perfect, will bring the house edge down, near to this level. Call with Q high or J high, so long as the board is not suited and you do not hold that suit in your hand. The Casino Holdem game on 888 Live Casino, offers you an 'Aces or Better' side bet. While the payouts are attractive, like all side bets this is generally a sucker bet, where you give-up an unnecessary advantage to the house. In this case the house will gain a 6.26% edge. If you wish to play the Ace or Better bet, you must place your wager in the marked area, before the deal. Once the Flop is dealt, if you can make a five card poker hand, ranking AA or higher your bet will be paid accordingly. The Aces or Better bet is paid out separately to the main ante and call bet, so you will still get paid out even if you lose the hand. Those recommendations once again: where to find the best Casino Holdem live dealer games online!